Supporting women’s rights organizations in the belief that, just as a group of women has greater strength than one woman alone, women can best bring about significant change by getting together. 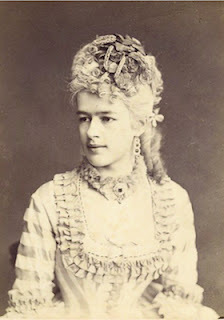 1911 First ever International Women’s Day celebrated. 1915 Women from the U.S. and Europe gather in The Hague in the Netherlands for the first International Congress of Women -- later known as the Women’s International League for Peace and Freedom. 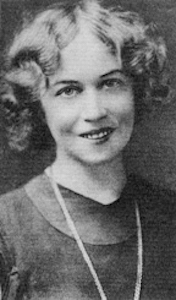 1932 Alexandra Kollontai is appointed ambassador from the Soviet Union to Sweden. She is considered the first woman ambassador in modern history. 1945 Eleanor Roosevelt becomes the American delegate for the recently formed United Nations. In 1946 she is elected as the head of the United Nations Human Rights Commission. She is instrumental in drafting the Declaration of Human Rights. 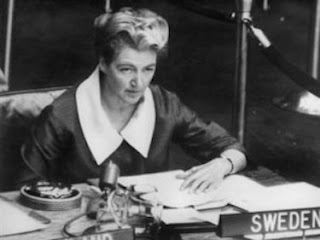 1958 Swedish diplomat Agda Rössel is the first woman to head a permanent delegation to the United Nations. 1952 Covenant on Political Rights of Women enacted by the United Nations, calling for women's right to vote and right to stand for elections. 1971 Helga Pederson becomes the first female judge on the European Court of Human Rights. 1973 Tennis star Billie Jean King wins the “battle-of-the-sexes” tennis match against Bobby Riggs. 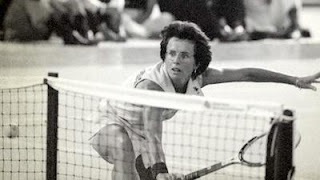 The event is highly publicized and serves as inspiration for demands for equal rights and opportunities for female athletes. 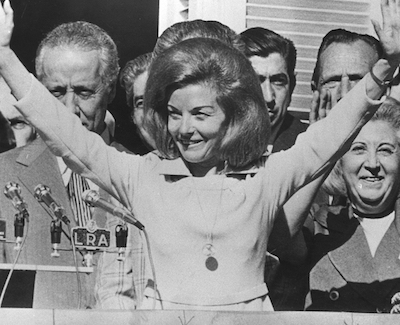 1974 Isabel Martínez de Perón becomes President of Argentina and the first female president in America. 1979 The UN General Assembly adopts the Convention on the Eliminations of All Forms of Discrimination Against Women. It defines what counts as discrimination again women and creates an agenda for nations to adopt. Margaret Thatcher is elected Prime Minister of the United Kingdom, becoming Europe's first female elected head of state. 1986 Maria Corazon Aquino becomes the first female President of the Philippines and the first female president in Asia. 1995 The 4th World Conference on Women is held in Beijing, China and results in a global Platform for Action for women’s equality, empowerment and justice. The International Conference on Population and Development in Cairo creates a Program of Action. Some of the goals outlined by the Program of Action include, achieving universal education, reducing infant and child mortality, reducing maternal mortality, and achieving access to reproductive and sexual health services including family planning. 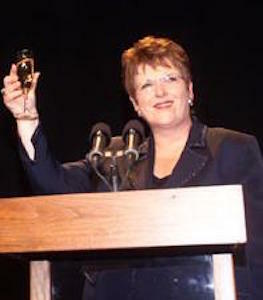 1997 Jenny Shipley is elected Prime Minister of New Zealand and becomes the first female head of state in Australasia. 2000 The Millennium Development Goals (MDGs) are developed and include a goal to promote gender equality. 2000 Groundbreaking UN Security Council Resolution 1325 on Women, Peace and Security adopted, recognising the impact of conflict on women and girls and calling for UN member states to involve women in peace building. 2004 Wangari Maathai, a Kenyan environmental activist, is awarded the Nobel Peace Prize. She is the first black African woman to win a Nobel Prize. 2005 Women defend their gains at the ten year review of implementation of the Beijing Platform for Action and successfully defeat a proposal led by the U.S government for an anti-abortion amendment to the declaration. 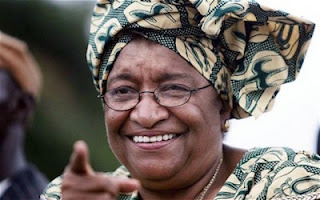 2006 Ellen Johnson Sirleaf becomes President of Liberia, the first female elected head of state in Africa. 2007 The first all-female UN Peacekeeping unit is deployed. It is made up of over 100 policewomen from India and it is sent to Liberia. 2008 UN Security Council Resolution 1820 adopted, recognizing that sexual violence can be categorized as a war crime; calling for protection from violence in refugee and displaced person camps; and affirming the need for women’s full participation in peace-building processes. 2011 UN Women is formed out of a number of existing UN organizations to further the empowerment of women and girls and to advocate for gender equality. 2010 The Secretary-General appoints a Special Representative on Sexual Violence in Conflict. 2011 Council of Europe Convention on preventing and combating violence against women and domestic violence adopted as the second legally binding regional instrument on violence against women and girls. 2012 United Nations passes a historic resolution outlawing Female Genital Mutilation. UN Day of the Girl celebrated for the first time on 11 October. 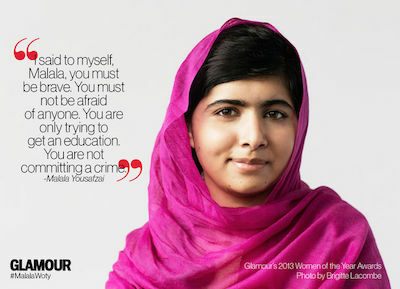 2014 Malala Yousafzai became the youngest person ever to be awarded a Nobel Peace Prize. 2015 Sustainable Development Goals launched, including a gender equality goal and targets about ending violence against women and ensuring equal participation. 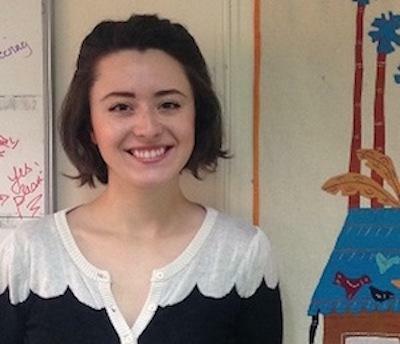 Some hopes that I have for women in 2016 and future years include the following, as Womankind volunteer Maggie Craig mentions in her Dec. 13, 2015 blog post.